Girls learn differently from boys. That’s why we believe in a girls-only education, where we can ensure the best teaching environment in which girls thrive and succeed. We believe in a positive learning environment and understand that every learner is unique, and that learning is a social process that can take place anytime, anywhere and with anyone. We believe in the power of discussion, where teachers and girls listen to each other, share their ideas and consider alternative viewpoints. 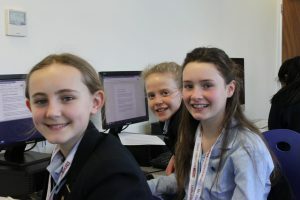 Our girls are able to articulate their ideas freely, without fear of embarrassment over ‘wrong’ answers; and they help each other to reach common understandings. We believe that girls need a delicate balance between being challenged; allowing them to move from shallow to deep learning, and having a secure learning environment where their confidence can grow. To find out more on single gender education, take a look at our presentation on how girls learn. This approach is at the heart of everything we do, from the way our teachers teach to how our girls learn. Setting goals, providing feedback, encouraging discussion, making the classroom a friendly and supportive environment where mistakes are embraced – all of this makes up a recipe for success, where girls feel comfortable and happy. A happy girl is a successful girl after all. Our school aims and values reflect this. “I love that the teachers are so supportive and that their main concern is that we are happy. Learning isn’t only about stretching the mind. We provide the most exciting, creative and challenging enrichment opportunities for our girls to take risks and grow their confidence and self-awareness in the wider world. They constantly take pride in achieving things they never thought possible.